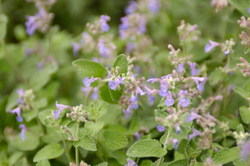 Catnip tea… an herbal treat with medicinal virtues. Catnip, a perennial belonging to the mint family, is better known for its strong effect on felines. Nepelactone, one of its active ingredients, is responsible for producing a euphoric response in cats. If you own cats, you already know how crazy felines can get after consuming a few leaves of this herb. Interestingly, catnip has a completely different effect on humans. For starters, it works as a natural sedative. It also alleviates different types of aches and pains. Best of all, catnip tea is very easy to prepare. Below you will find a list of the many benefits of this herbal tea and information on how to make cat-nip tea. Important note: The information presented here is for educational purposes only. It is not professional advice. Consult your doctor if you think you have a medical condition. It is a natural sedative. 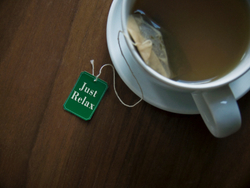 Drinking cat-nip tea will calm you down and help you to reduce stress. Many people use it to get a better night’s sleep. It is also a muscle relaxer and anti-spasmodic. Cat-nip tea can also help to reduce the intensity of headaches and even migraines. This wonderful tea helps relieve many cold and flu symptoms. For example, catnip acts as a decongestant, and it can be used to bring down fevers. In addition, it soothes a sore throat. It can also be used to alleviate many digestive problems, including stomach aches and indigestion. Cat-nip tea is, by the way, a natural anti-acid. Cat-nip tea can also relieve menstrual cramps. In small doses, cat-nip tea is safe for babies and small children. This beverage may help to alleviate pain caused by teething. It can also reduce anxiety and restlessness, so it can be of great help for hyperactive children. Do consult your child’s pediatrician before giving it to your child. Even though tea made of cat-nip is relatively safe, it has a few side effects. 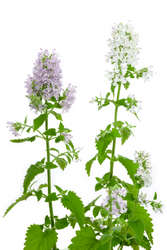 Pregnant women should avoid drinking cat-nip tea as it may cause uterus contractions. Cat-nip tea is a natural diuretic, so if you drink it in large quantities it can cause frequent urination. It can also cause drowsiness, so don’t drink it if you have to drive or operate machinery. Now that you know about the wonderful attributes of this minty herb, you’re ready to make some catnip tea. Here are a few tips. You can use either dried leaves or fresh catnip. Place 1 teaspoon of dried leaves into a cup. Pour hot water into the cup and cover. Do not boil the water as it will dilute the catnip’s flavor and lessen its medicinal benefits. If you are using fresh leaves, use 2 teaspoons. Alternatively, you can use a tea infuser to place your catnip leaves in. Let your catnip steep for about 10 to 15 minutes. To give it a twist, you may add a touch of lemon, honey, or fruit juice. You can also mix your catnip leaves with peppermint for an extra-minty flavor. Cat-nip can be drank hot or cold. A great cat lover gift idea is to give a pet gift basket filled with cat-nip toys and treats for your friend's cat and cat-nip tea bags and accessories for your cat loving friend. The following items make great gifts, by the way. They are brought to you in affiliation with Amazon.com. More catnip toys - Make your own cat-nip toys. Find several ideas here. What is cat grass? - Learn about it here.